There are plenty of snack subscription services that will transport your taste buds to another country; I’ve had the pleasure of sampling local delicacies from Japan, Italy, Bulgaria, Croatia, Lebanon, Mexico and England, all from the heart of American suburbia. But that’s not even the tip of the treat-tastic iceberg; just below the proverbial water line, there are 1,000+ snacks and candies from 100+ countries waiting to be tasted. For the true snack Shackleton, there is only one way to explore the far reaches of this vast world of snacks – Universal Yums. 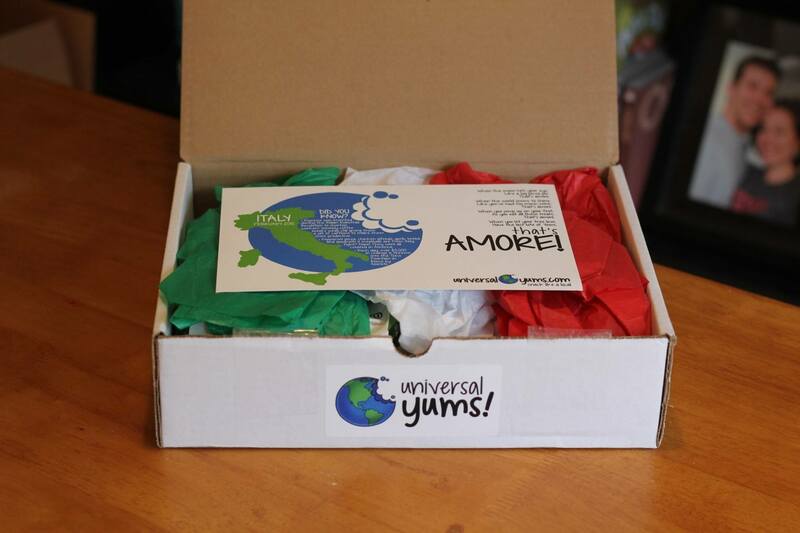 Universal Yums is a new international snack subscription service that will deliver different snacks from different countries each month, sending your mouth on a cross continental smorgasbord from the comfort of your own home. Signing up will get you a mix of carefully curated snacks – salty, savory, spicy and sweet – from that month’s featured country, no repeats. I say again, irony very much intended, NO REPEATS! Universal Yums promises their around the world snack-venture will cover all 196 countries, taking 16 years to complete. Maybe more if Texas secedes from the union. There are two subscription sizes: A $13.00 Yum Box with 6+ snacks and a $25.00 Yum Yum Box with 13+ snacks. 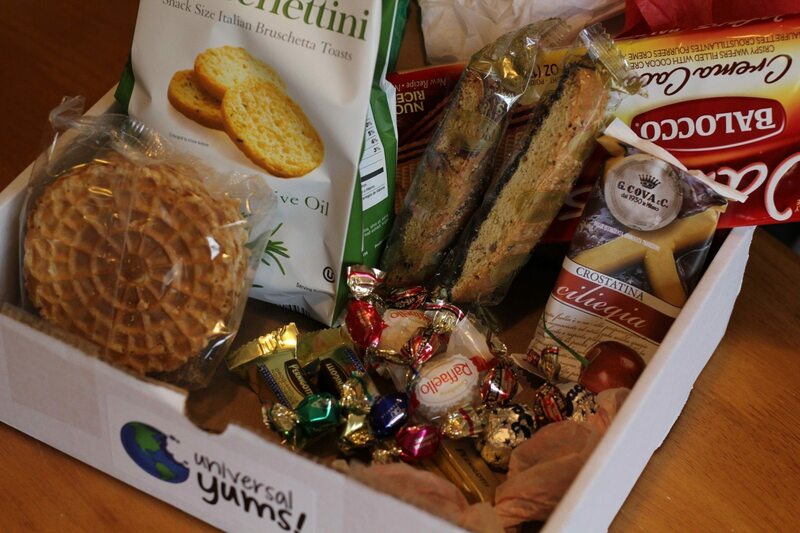 I received the full sized Yum Yum box, which contained more than a pound of snacks from Italy. Mangia! 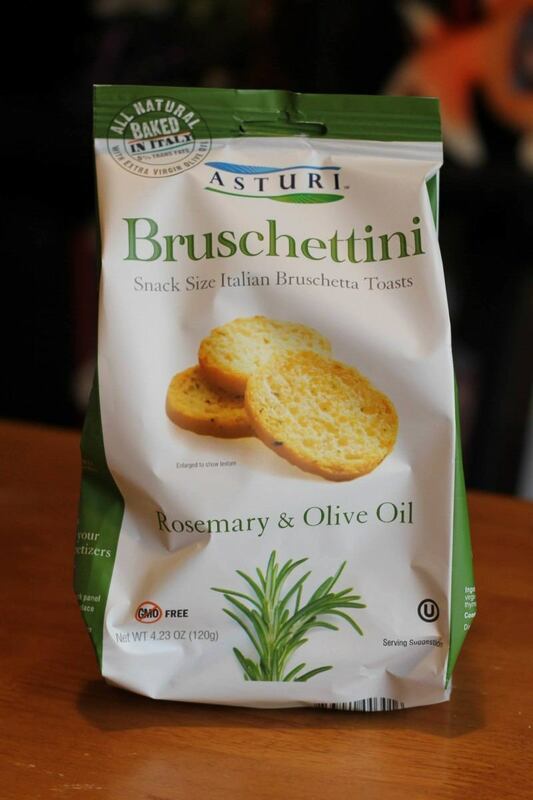 I didn’t expect to be impressed by these Rosemary and Olive Oil Bruschettini, bite-size versions of bruschetta sans the tomato topping. I thought they’d be boring, but I was delighted to be proven wrong by these tasty, airy, crunchy crouton discs OF THE GODS! 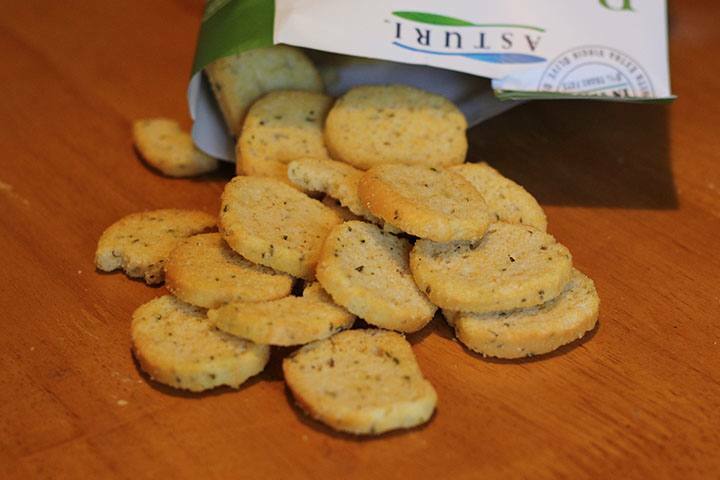 They taste like they were made today – super fresh, super crispy and seasoned with just the right amount of rosemary and olive oil. I’d totally serve these at a party with a tomato or olive tapenade, if I didn’t now know I would eat the whole bag before the first guest arrived. 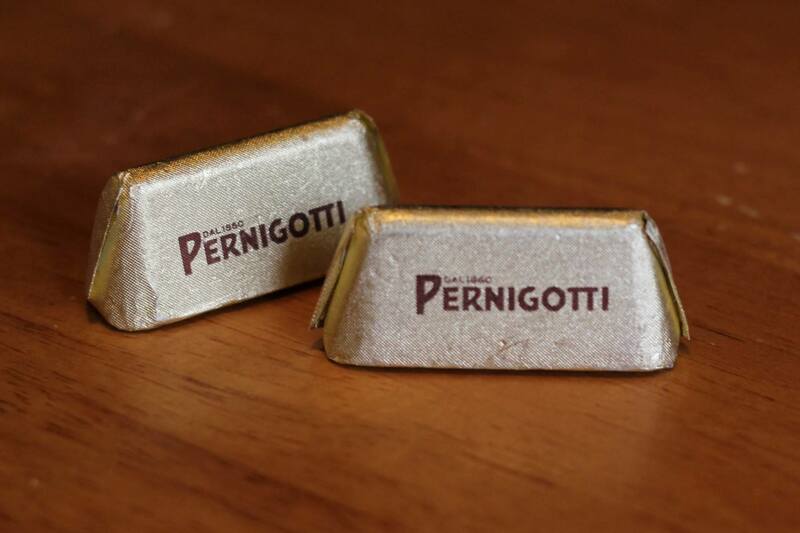 The minute this chocolate touches your tongue, you’ll understand why Pernigotti’s secret family recipe is a classic. They’ve been using the same ingredients since 1968, blending their decadent cocoa confections with gianduia cream (aka generic Nutella). This one-two punch of cocoa paste and hazelnuts results in decadent, creamy, silky smooth chocolate that melts in your mouth. And the hazelnuts make it taste like Christmas! These hard candies were labeled with different fruit flavors – lampone (raspberry), limone (lemon), fragola (strawberry), mirtillo (blueberry) – but the flavor is so subtle they just tasted sweet. The gel-like center tantalized my taste buds with a slightly more intense, slightly less mysterious hint of fruit flavor – I could probably identify the lime in a blind taste test, if there were no stakes and no time limit. Though still tasty, I wish these (mostly) berry-inspired bon bons were more confident in their fruit identity. 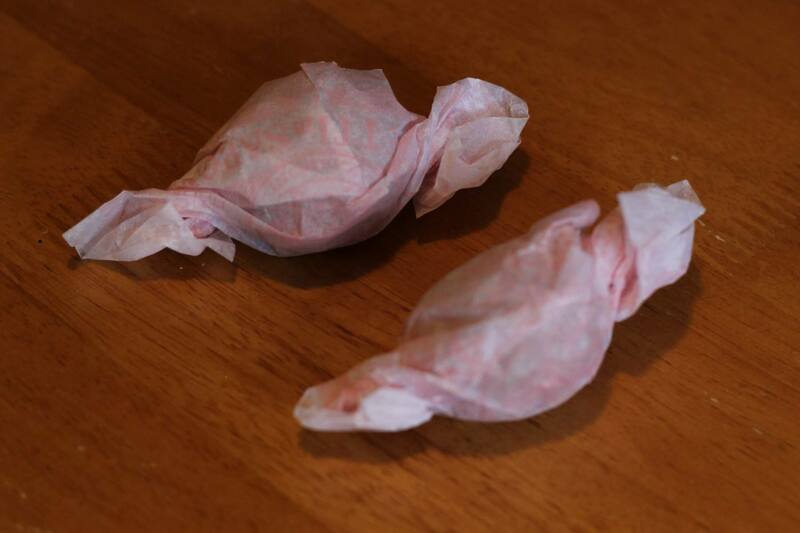 Bye Bye Coffee n’ Cream Bons Bons are a shot of espresso given hard candy form. They’re sweet, with a strong taste and aroma of dark, rich roasted coffee beans. My sister was a little put-off by the shape, which reminded her of a Halls cough drop. 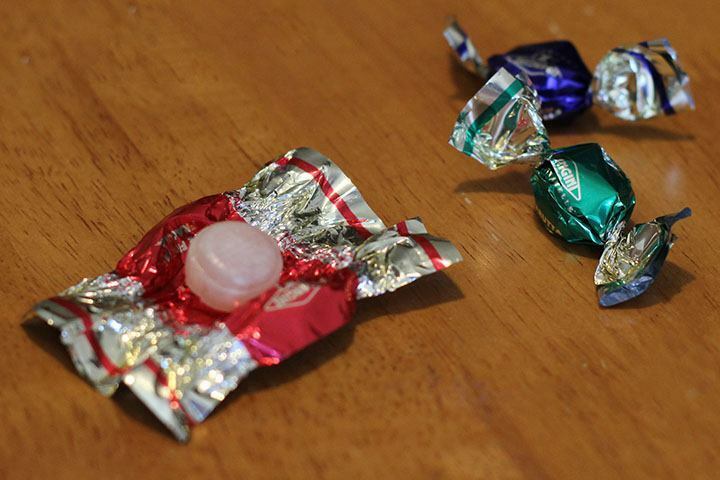 According to her, Werther’s Original really cracked the code when it comes to the perfect hard candy shape. 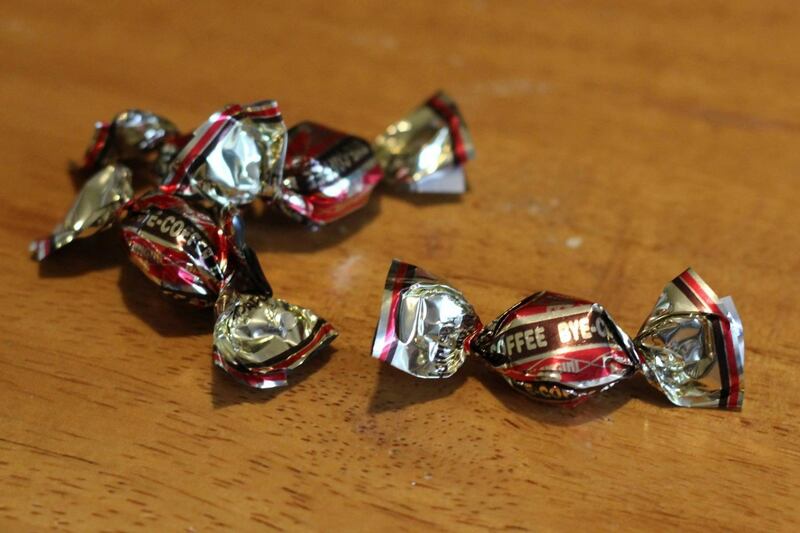 But the opinion of sisters and grandpas aside, I liked these coffee candies much better than their fruity brethren. It’s a delicious cup o’ joe that will never spill or burn your mouth, so what’s not to love? 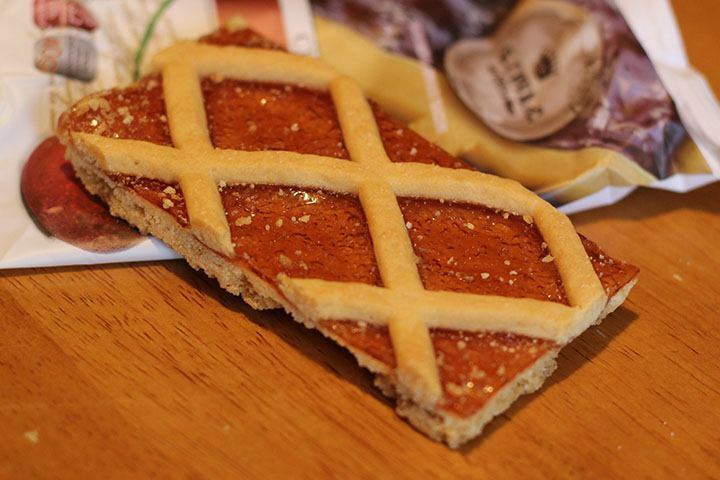 Italy has been baking (and baking again) this crispy cookie since the 13th century, so they’ve sorta got the recipe down. 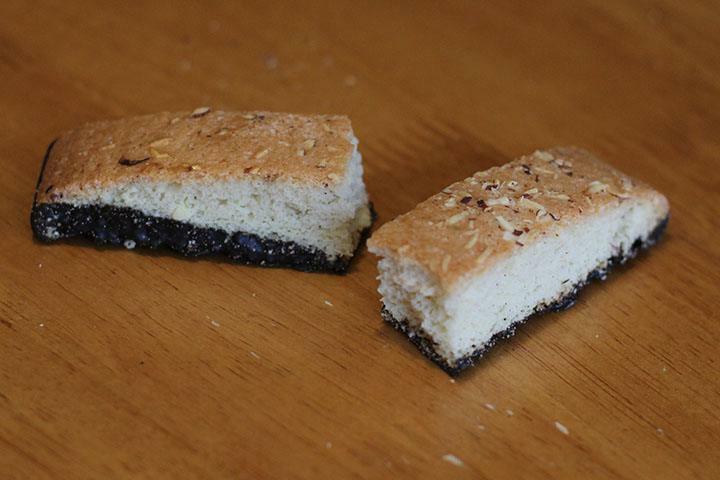 This biscotti had a slight licorice flavor, as anise seeds are the hallmark ingredient of this centuries-old Italian favorite. I hate anise. I am like a truffle pig when it comes to snuffling it out, no matter how miniscule the quantity. But, combined with the satisfying crunch of the twice-baked bread and the decadent layer of bittersweet dark chocolate, it just worked. 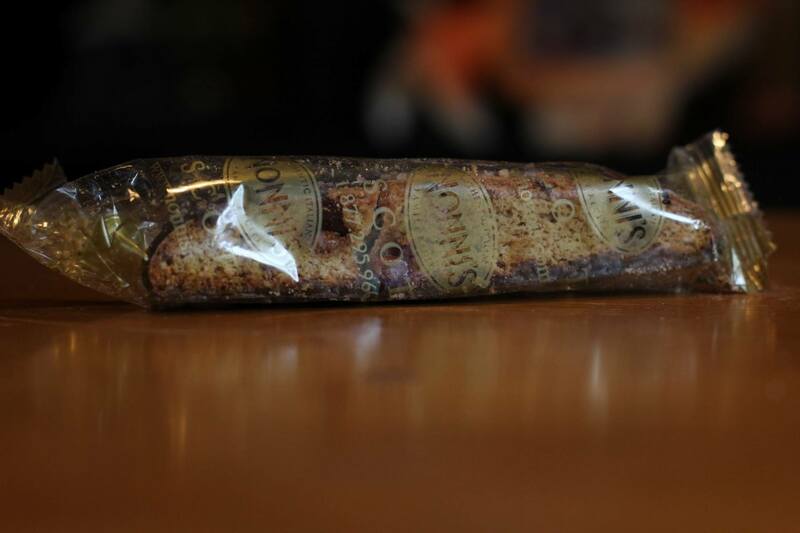 I guess I have to focus all my hatred on anchovies now. Whole chunks of salted caramel? Dipped in milk chocolate? Dusted in sugar crystals? Yes, yes and yes. 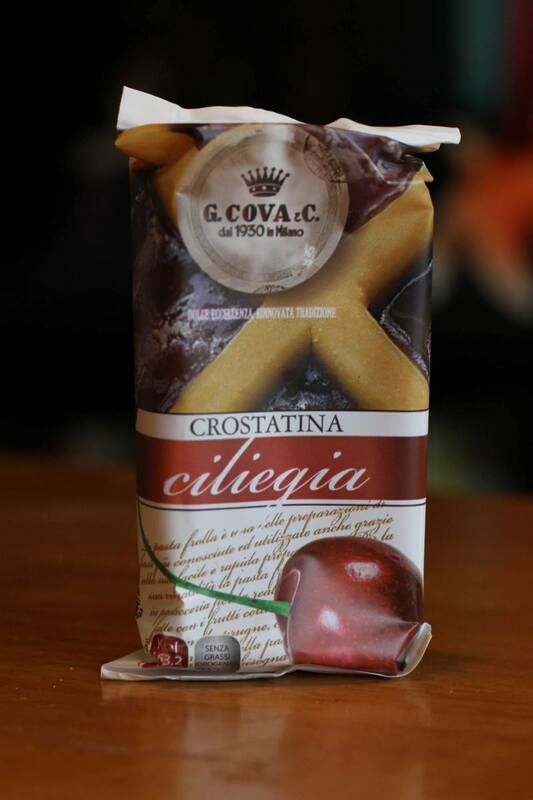 The combination of salty and sweet is my absolute favorite, so despite suggestions to dip it in my coffee or tea (or, as the Italians do it, in my wine or orange juice) I enjoyed it on its own. Delizioso? Va bene. 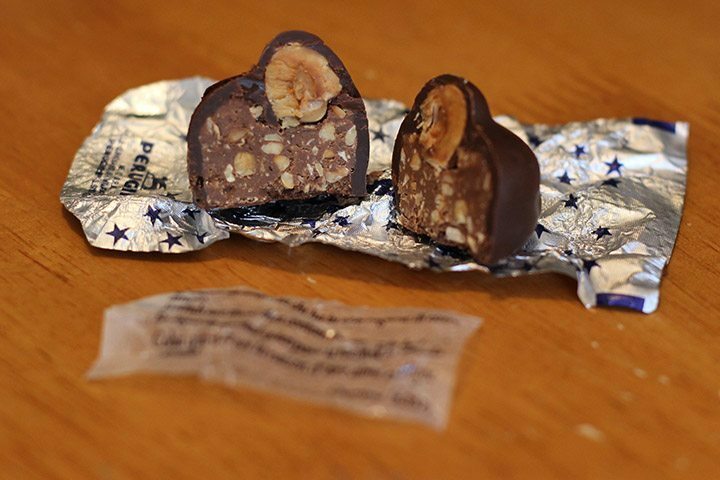 “Baci” translates into “kisses” in Italian, making this hazelnut filled chocolate the Italian way of saying “I love you.” And there’s lots to love. 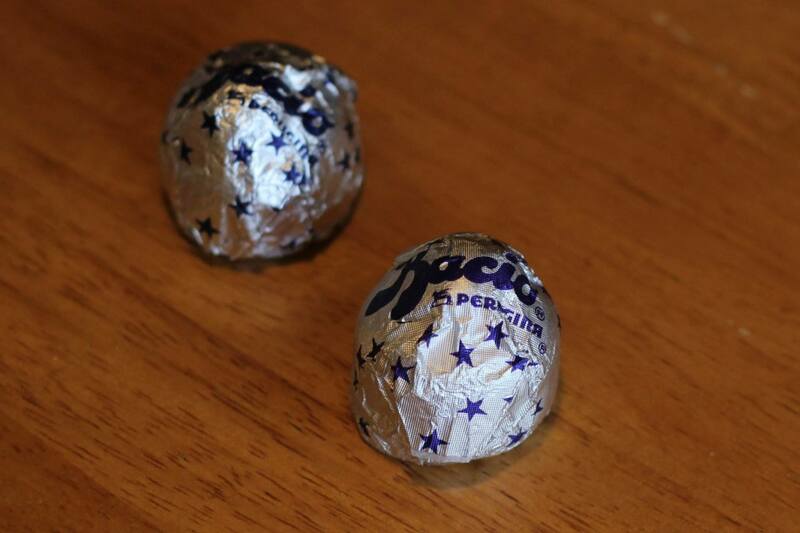 In addition to being big on feelings, wrapped in a multilingual love note, every baci is just plain big. It’s the sentiment of a Hershey’s Kiss (but bigger) combined with the texture of a Mr. Goodbar (but tastier). 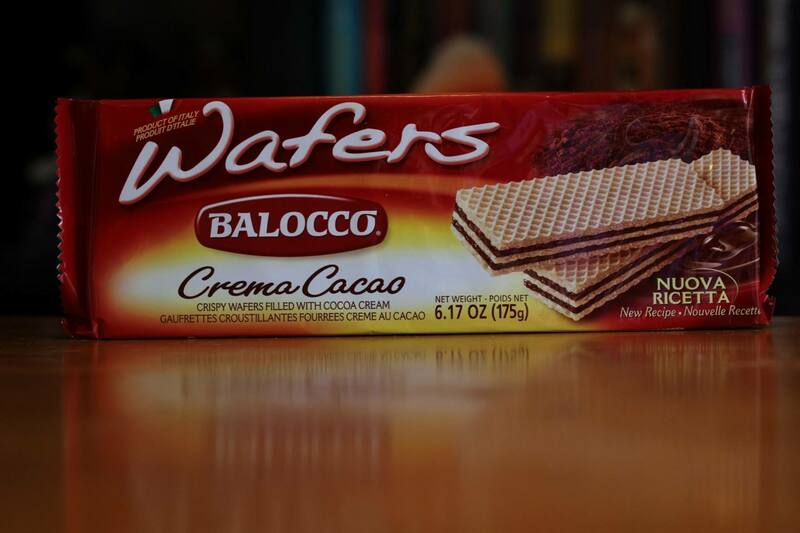 There’s no lemon in these, despite what the name implies, just delicious waffle cookie goodness. 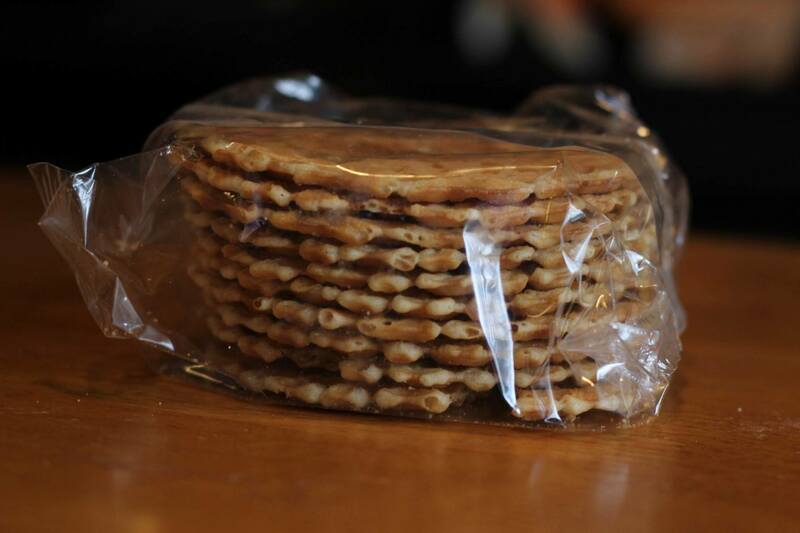 I’ve had waffle cookies before, but they weren’t this good. These pizelles were super thin and super crunchy, perfect paired with a steaming cup of tea. I absolutely adored them and felt no compunction in lying to my friend Chrissy that they were all gone. You were out of control Chrissy, and you know it. Described by Universal Yums as “a classier version of a pop tart,” this fruit filled pastry defied my decidedly lowered expectations! 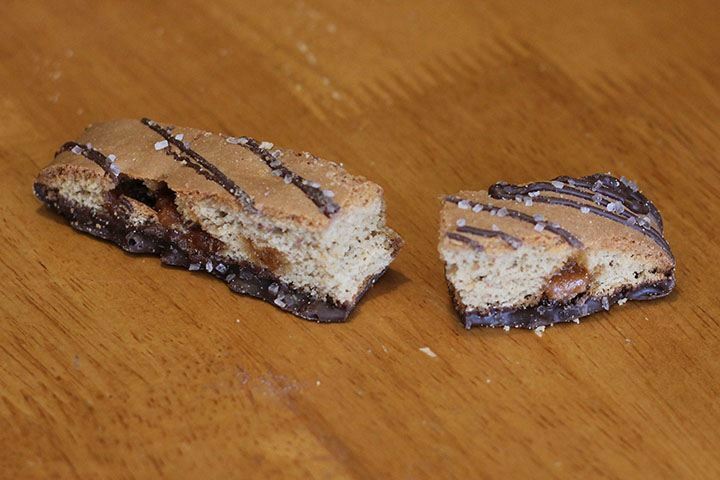 It’s dressed up like a slice of pie, but tastes like a fancy cookie; the crumbly texture, buttery flavor and super sticky fruit jam reminded me of a Pepperidge Farm Verona, a child and adulthood favorite. And unlike a pop tart, there was none of that chemical smell and artificial taste. The flavor I got in this box was cherry, but they also come in apricot, strawberry and mixed berry. Tasting the full flavor range joins pulling off a museum heist with the help of a specially trained sloth sidekick and having brunch with Jessica Lange on my bucket list. 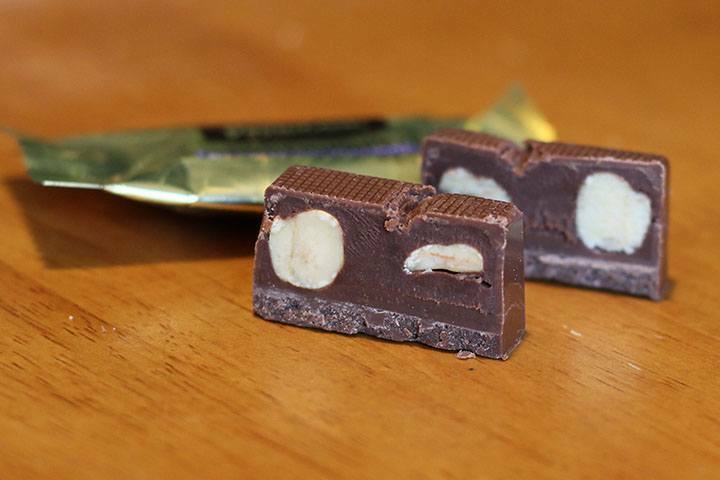 Italians have never met a hazelnut they didn’t want to cover in chocolate. 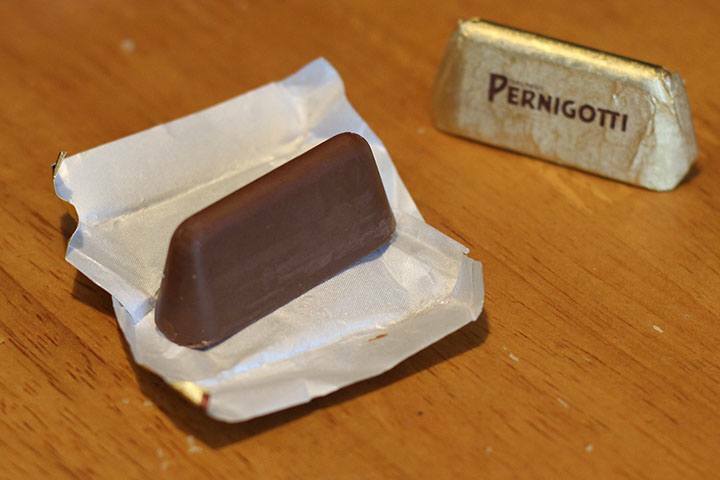 Inside this small cocoa confection are 2 whole roasted hazelnuts surrounded in hazelnut cream. As much as I enjoyed the Classici, it turns out I like my chocolate chocolately and my hazelnuts hazelnutty. 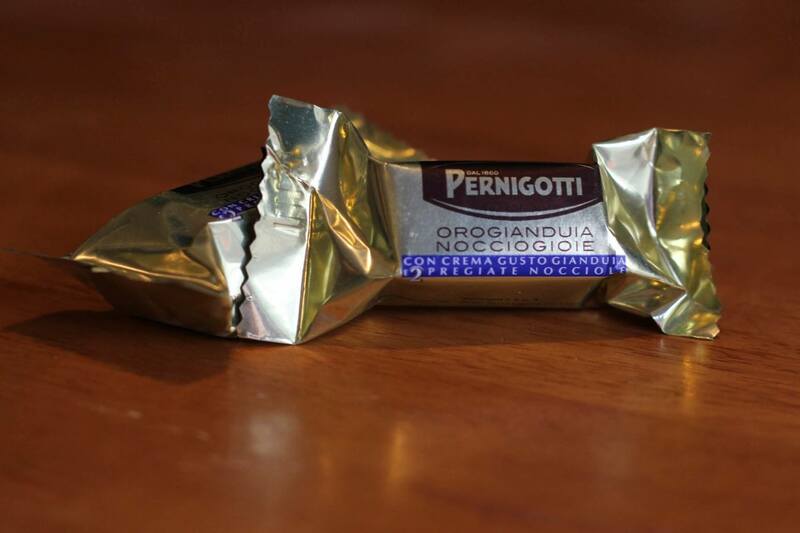 The Nocciogioie, with it’s layers of milk chocolate, hazelnut cream and hazelnut, was more fun to eat; three different textures, three different flavors, blended into a single bite-sized, melt in your mouth morsel. I’m glad they packed two. 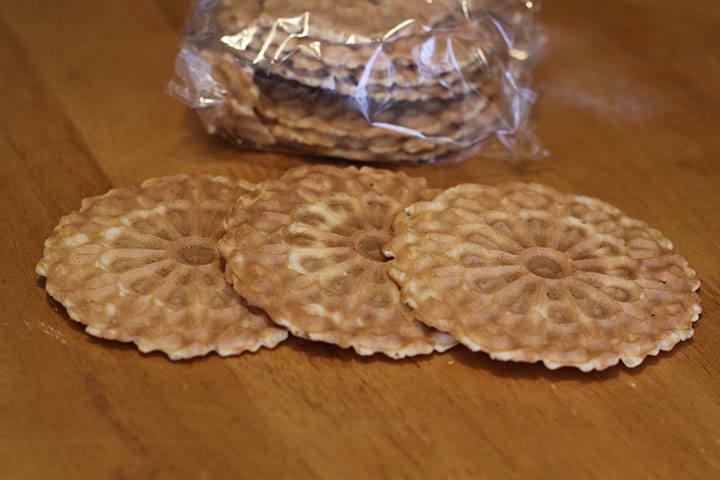 To me, these are the quintessential Italian cookie. A slightly caramelized outside. A bittersweet, almond-like flavor. A crunchy, chewy texture. 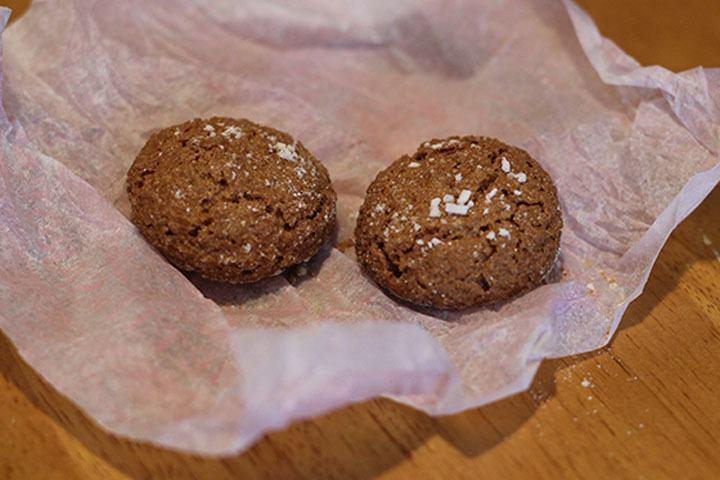 Their flavor is so sublime, it’s hard to believe that Lazzaroni Amaretti di Saronno cookies have only three ingredients: sugar, egg whites and apricot kernels (giving them that spicy, almond-y taste). According to tradition, after you eat the cookie, you take the wrapper and roll it up, put it on a pate, make a wish and set it on fire. 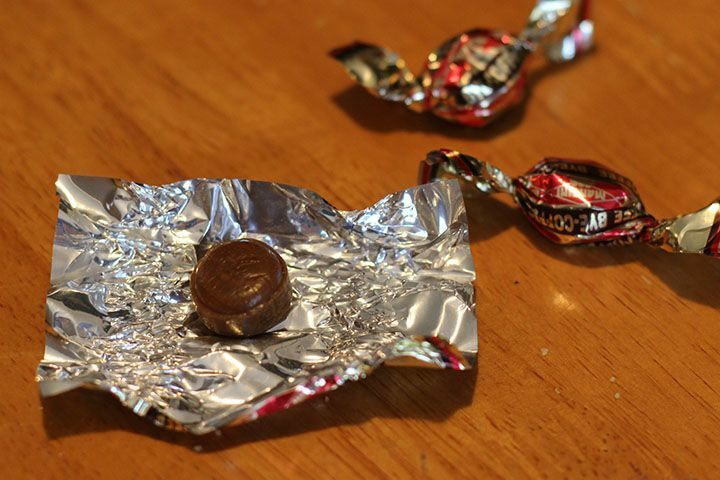 If your wrapper floats up to the ceiling, your wish will come true. Pretty sure I was supposed to light it from the bottom, but in retrospect this outcome seemed preeeeetty apropos. You got my number, cookie. All my dreams have gone up in flames, and there is naught left but the ashy taste of regret. 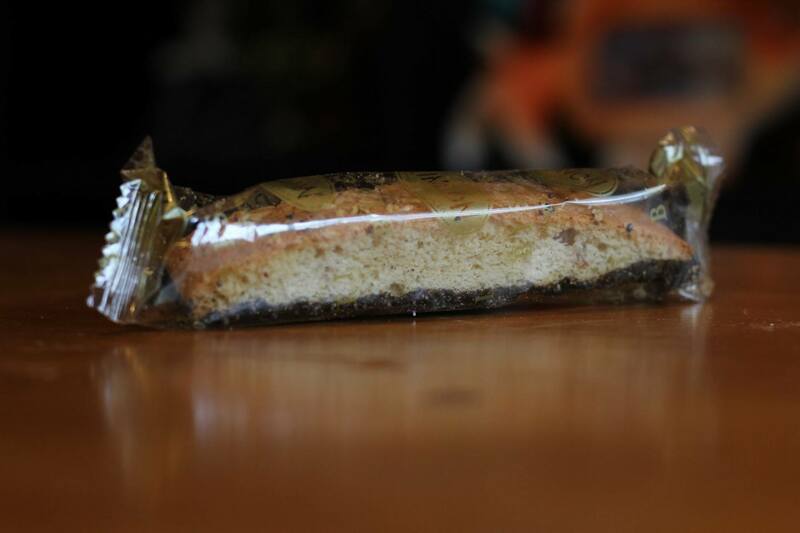 Thankfully, the palette is easily cleansed with another cookie. 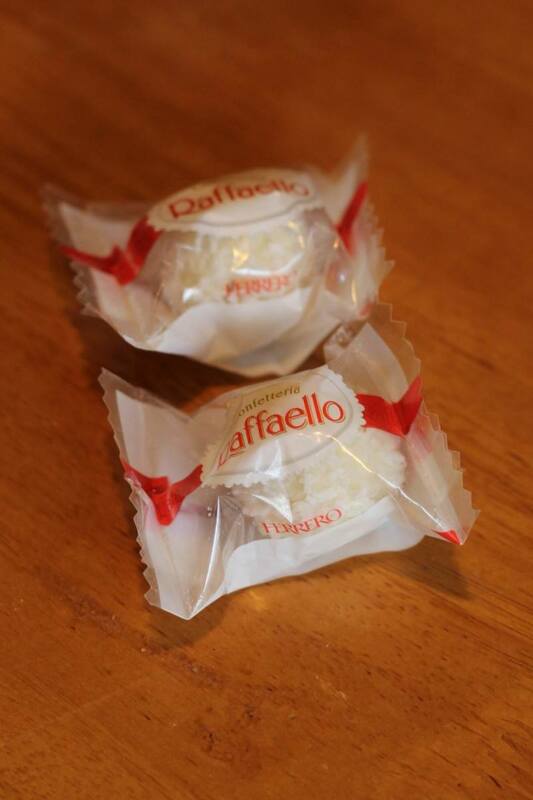 If you love coconut, you will love these Ferrero Raffaello, from the same makers of Ferrero Rocher. They’re made with coconut cream surrounded by a coconut crunch surrounded by, you guessed it, coconut. 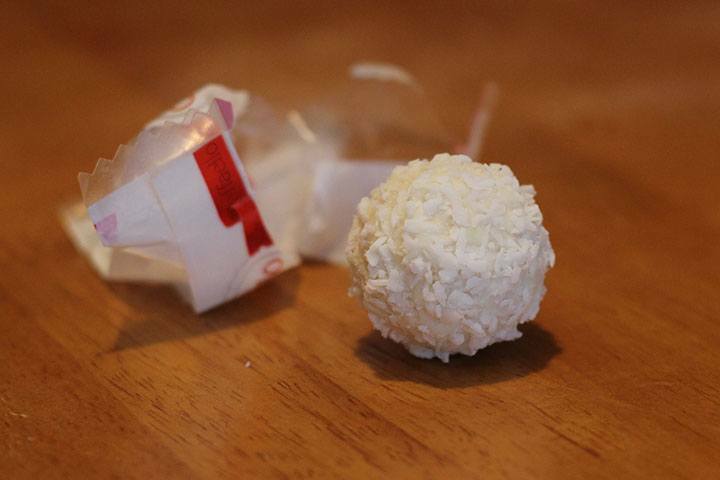 I meet my reccomended daily coconut intake solely via drinks with little umbrellas in them, but I could still appreciate the candy craftsmanship that went into making this miniature snowball. And even if you don’t like coconut, power through its copious layers of copra and you’ll be rewarded with a whole almond in the middle! 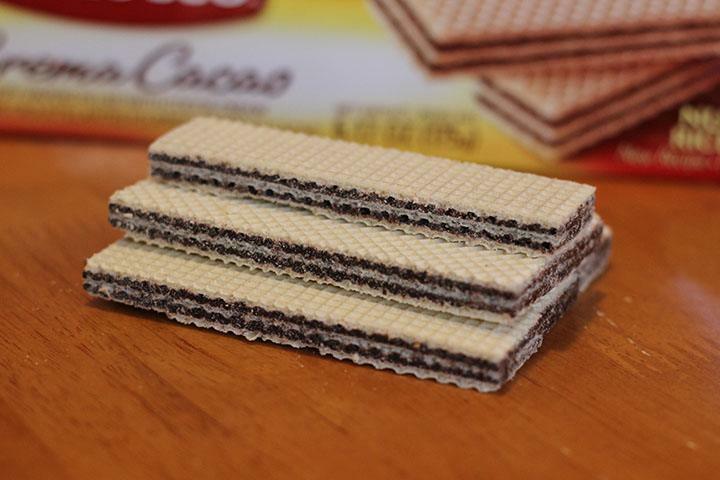 These look like your typical wafer dessert – some dark chocolate sandwiched between crispy wafers – but do not be fooled! Consume these without a beverage near to hand at your own risk! The chocolate, like all the chocolates sampled in this box, has a rich flavor – like the chocolate cookie part of an Oreo – but they will make your mouth feel like the driest corner of the sunniest desert. 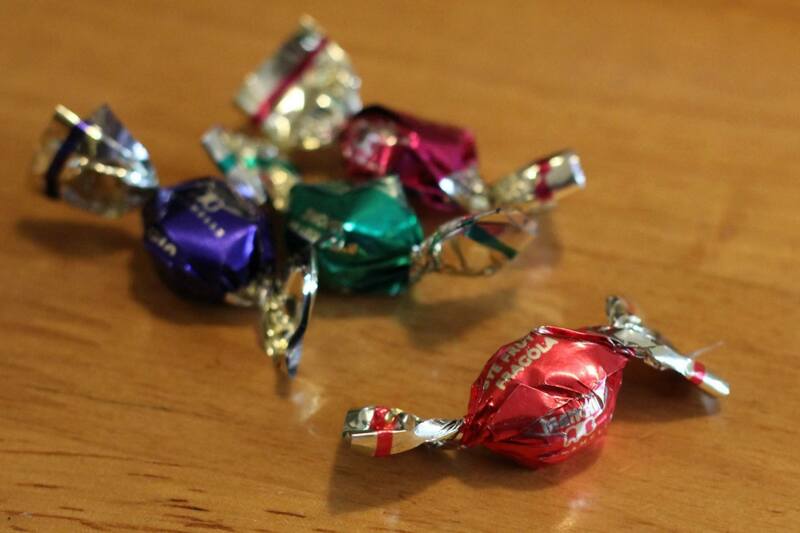 If one of these should brush your lips on the way to your tongue, they will stick to your face. Forever. I have slowly learned to adjust to life with a wafer stuck to my lips, but still dream of a day medical science finds a way to safely remove it. That being said, it would be perfect to dip into a hazelnut spread or hazelnut dressing or to serve with a hazelnut soup. Universal Yums may be one of the newer snack subscription services on the market, but in a few short months it’s already proven itself one of the best. I loved their presentation; lovingly packing my munchies with green, white and red tissue paper, the colors of the Italian flag. I loved their service, with an easily navigable website featuring a breakdown of all the items (to match the glossy contents card included in the box) along with their individual ingredients. And most of all, I loved their selection, building each box around diverse and delicious snacks and treats from a different country every month. My only regret is not discovering them before Germany and Brazil shipped. Sign up today – there’s still 193 countries to go!